Acclaimed industrial designer Ross Lovegrove’s London studio is a surreal, white space filled with ultra-modern knickknacks of his own design. 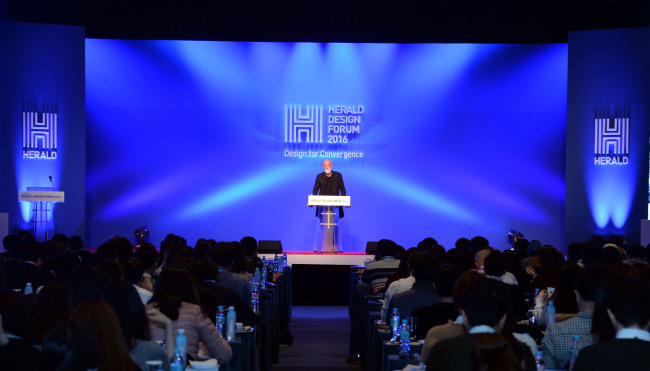 “I surround myself with models and objects which are of my world, and I like being in my world,” Lovegrove said at the second session of Herald Design Premium Talk on Tuesday evening at Seoul’s Grand Hyatt Hotel, showing photo slides of his studio to an intimate gathering of design executives and experts. “When in doubt, I know where I am. As an artist, I think you have to be continually self-referential, while being aware of what others do. But don’t get paranoid about what others do,” said Lovegrove on his creative philosophy. As shapeless and bizarrely abstract as his creations, Lovegrove’s talk was meandering but inspirational, touching on topics such as artistic integrity and the impact top management executives’ choices have on art. The 58-year-old Wales native is known for his fluid, futuristic designs. He gained acclaim as the designer of the Sony Walkman cassette tape player in the 1980s, and has since collaborated with brands ranging from Peugeot to Tag Heuer. “I could talk all night because I love my profession. And when everything takes years, how can you articulate two or three years in two or three minutes?” Lovegrove asked. Lovegrove’s studio is a trove of the designer’s identity with pieces like “nomadic solar architecture” Solar-C, a winding staircase that he dubs “DNA,” and numerous 3-D prints on display. “When you’re with these objects, they feel incredibly human, and they are human,” he said. Lovegrove also emphasized the importance of “using the tools of the time,” of being up-to-date with the most current technology. The advancement of technology, conversely, has heightened the value of the analog, Lovegrove added. Showing slides of hand-drawn paintings in his journal, he pointed out that now, computers are able to replicate the intricacy of analog drawings. 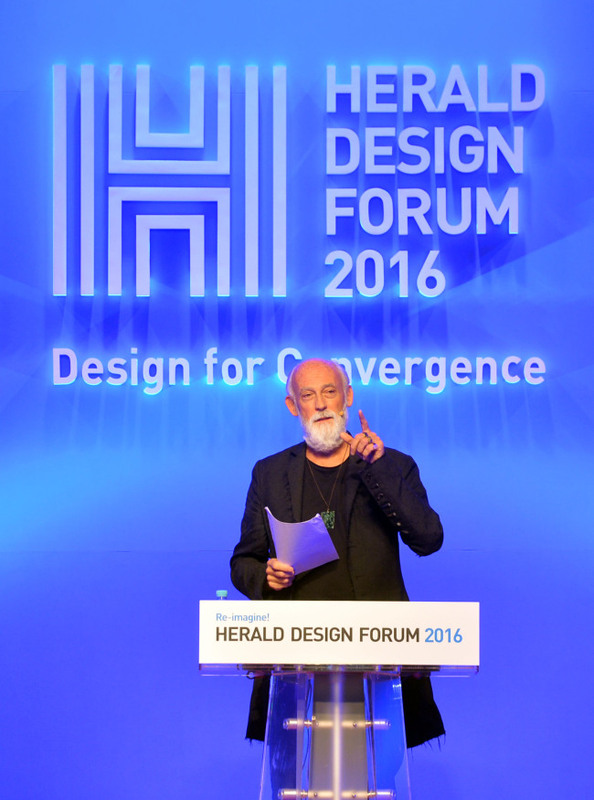 “I believe that a design’s longevity depends on how ‘pure’ it is,” he said, detailing the many projects he has undertaken since his studies in luxury and craftsmanship at the University of Art and Design in Lausanne, Switzerland. Kim, 33, also conducted theoretical design research on the influence of physical and 3-D printer technology at Design Academy Eindhoven in the Netherlands. Kim’s list of collaborators ranges from luxury French crystal brand Baccarat to fashion brand Hermes. Kim’s simple, luxurious and functional designs have nabbed him international attention. Design magazine Wallpaper featured Kim in August, spotlighting the mini-golf course that Kim designed to be installed at hotels. “Relating to people as a communicator is important,” Kim noted.